Communication Edge: Has a USB type B connector. Screw Terminal Edge: Convenient connections for 4 analog inputs, both analog outputs, 4 flexible digital I/O (FIO), and both current sources. The screw terminals are arranged in blocks of 4, with each block consisting of Vs, GND, and two I/O. Also on this edge are two LEDs. One simply indicates power, while the other serves as a status indicator. DB Edge: Has 2 D-sub type connectors: a DB37 and DB15. The DB37 has some digital I/O and all the analog I/O. The DB15 has 12 additional digital I/O (3 are duplicates of DB37 I/O). USB: All power and communication is handled by the USB interface. DAC#: DAC0 & DAC1 are the 2 analog outputs. Each DAC can be set to a voltage between about 0.02 and 5 volts with 12-bits of resolution. FIO#/EIO#/CIO#/MIO#: These are the 20 digital I/O, and are also referred to as DIO0-DIO19. Besides basic digital I/O operations, some of these terminals can also be configured as Timers & Counters (frequency input, PWM output, etc. 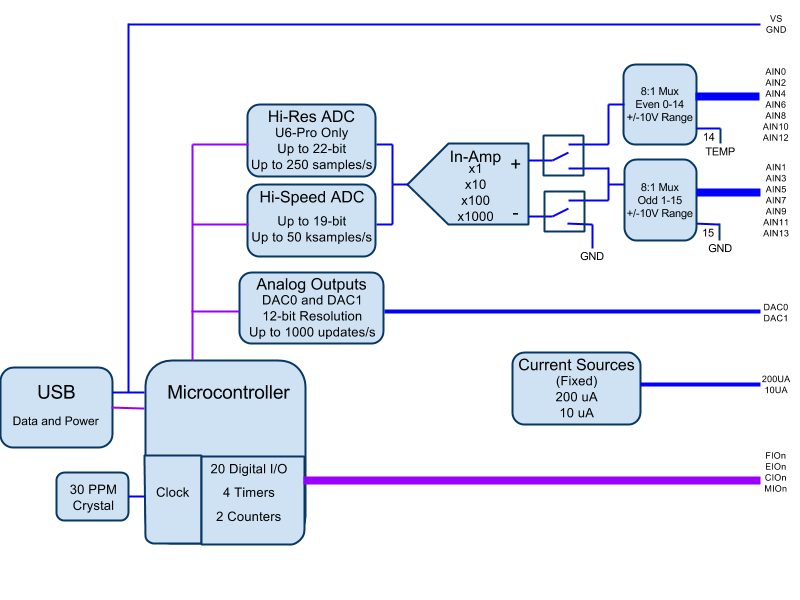 ), SPI serial, I2C serial, and Asynchronous serial. I would go to the section related to the terminals you are interested in. If you don't find what you need there post in that section. For example, if you are wondering about how to connect a sensor to analog inputs, go to Section 2.6. If you mean the 1200x900 blowup of fig 2.2, that's because the web designer didn't understand how to set the palette transparency, making the terminal indications invisible in some browsers and image editors. That would be Google. It is a Google Drawing and they generate the png. Try this link. I made the Google Drawing public so you can look at the original. I also changed the background to white. See if the 1200x900 png works now.